After instrumental music suddenly became hot, around fifteen years ago, I was amazed to discover that many of the LP’s that I liked best never showed up in articles or on want lists. The genes for record collecting seem to be on the same chromosome as the genes for lack of imagination. For this, or any other mysterious reason, the records that the Dutch band Ekseption made in the late 60’s and early 70’s, have never become popular among collectors. Until this very day, their LP’s are mainly to be found in the cheap records sections of second hand stores. Which is strange, because it is great music. I have no idea if outside Holland anybody has ever heard of Ekseption, but it was a progressive beat band, with band members that had a classical background. They had massive hits in Holland with pop versions of works by Beethoven and Bach. 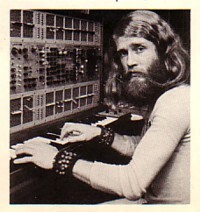 The band was centred around Rick van der Linden, who played organ and all kind of electronic instruments. He died in January of 2006. Ekseption recorded several advertisement records. My favourite is a 45 made in 1971 for International Computers Limited. For the occasion Rick van der Linden played an ARP synthesizer. 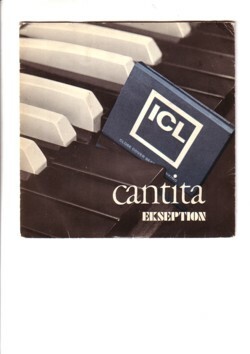 The tunes were written by Rick and inspired by Bach, and therefore called Cantita part 1 and 2 . The text on the back of the record seems to say that the ARP synthesizer has something to do with ICL, the company that released the record. But I don’t think this is really the case. But who cares, I am in it for the music.